Fougasse is a French loaf, usually found in Provence, which I have been meaning to post for a number of weeks. The leaf shape and rustic quality of this bread is something that absolutely captivates me – it is incredibly pretty. As such, it was something that simply had to find its way to FrugalFeeding, since the quaintly rustic look of my food often belies my decorative deficiencies. As it is a cousin of the Italian focaccia it lends itself well to all manner of different flavourings. Rosemary is always a particularly good choice with bread, since its flavour appears to penetrate a loaf with devastating efficiency. Indeed, despite the fact that only a few sprigs of rosemary were employed in the making of this loaf, the flavour of the rosemary can be easily tasted throughout. The addition of plenty of good-quality sea salt only adds to this. However, as I have already intimated, there is great scope for invention when it comes to bread. Olives, sun-dried tomatoes or chorizo would also make great additions to this superb bread. Considering what goes into a loaf like this, the price one can be expected to pay in a bakery for such a delight is rather unfair. As you shall see, the cost of the necessary ingredients hardly amounts to anything at all. Yet, many specialist bakeries will charge in excess of £3 per loaf. Of course, such bakeries do need to turn a profit to stay above water in this rather tumultuous financial environment. However, perhaps if those with enough time on their hands – and I realise that not everyone has time enough to bake every few days – could be shown just how easy it is to make delicious bread, then more people would endeavour to do so, thus saving themselves plenty of money over the course of a year. 1. 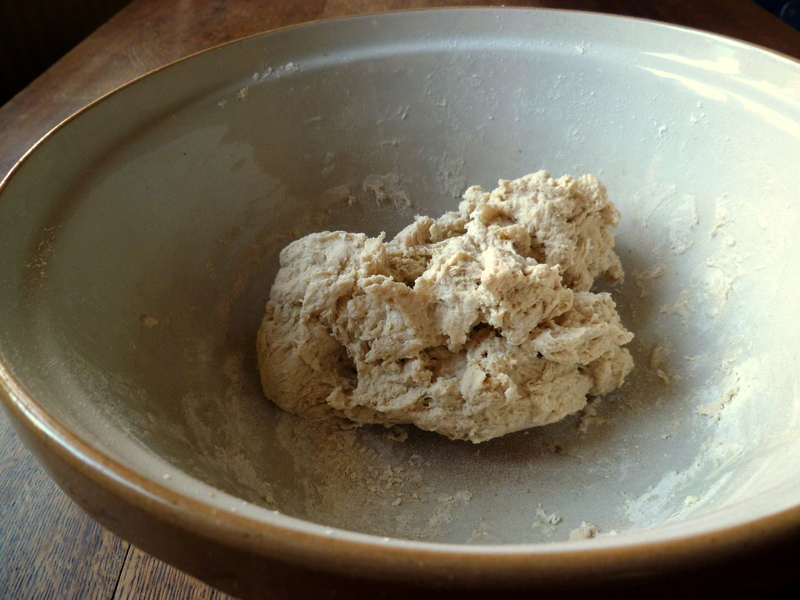 In a large mixing bowl, combine the flour, yeast and roughly 2 tsp of sea salt. Bring this together into a reasonably wet dough with the warm water. It should be dry enough to knead. Knead the dough for ten minutes, until smooth. 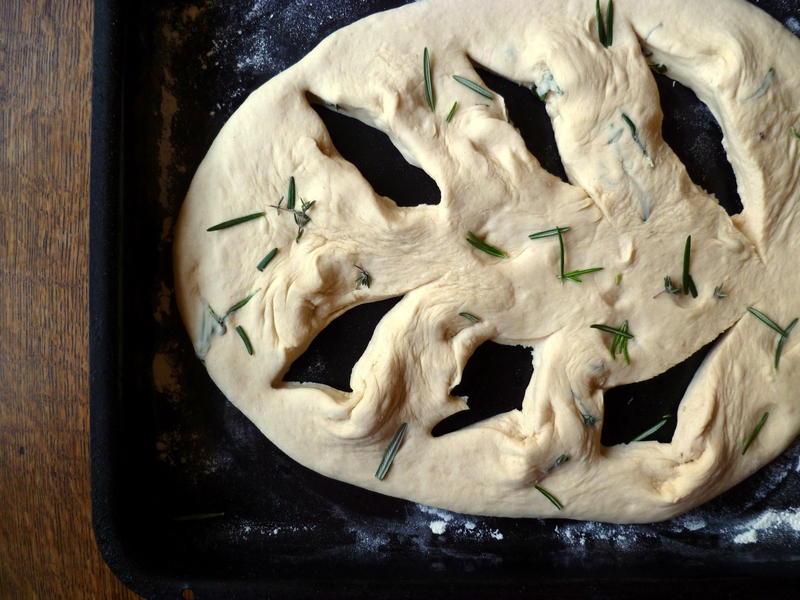 Push several sprigs of fresh rosemary and thyme into the dough and continue to knead for another minute. Roll the dough out into and cut with a sharp knife (see pictures). Place in a floured baking tray, cover in oiled cling film and leave to rise for an hour or so. 2. Pre-heat the oven to 200C. Brush the raw dough with milk and scatter over a very large pinch of salt. Once the oven is hot, pop the loaf in to cook for 30-35 minutes. Spraying the oven with a little water first will avoid too dark a crust. The fougasse is ready when it is golden brown and sounds hollow when tapped. Enjoy with a little olive oil. Cost: Let’s face it, flour is incredibly cheap. Indeed, this loaf should set one back no more than 50p – six times less than the price some bakeries expect us to pay. I’d certainly say that was worth a little of one’s time. Nice loaf there, real bread rocks! You should try an overnight sponge bread too, so easy to make artisan breads. Thanks! I shall have to try one. Thanks for this recipe Frugal … this is one of my favourite breads; in fact bought one from a French chain earlier! However, I make focaccia sometimes and now you’ve inspired me to try fougasse too. looks gorgeous! thanks for the simple, well-written recipe. looking forward to giving it a try! Thanks, I’m glad you thought it was well-written. I can easily imagine this one with a spring soup for lunch! Awesome. I hope he likes. 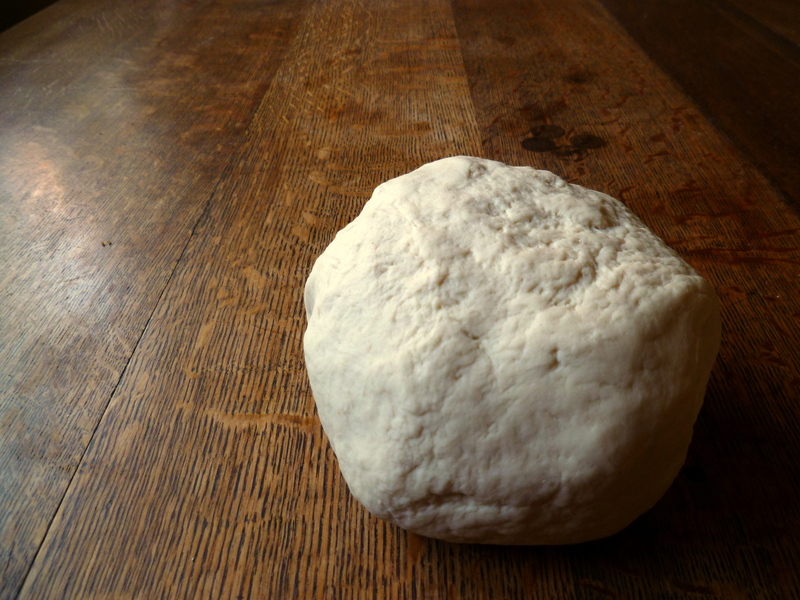 I have a pizza dough resting for tonight, a new recipe, my fingers are crossed. I just can’t nail down what I do wrong…should be so easy, just a few ingredients but somehow its usually too dense or heavy, cardboardish. It’s my weak spot for sure. So, I will sit and gaze longingly at your gorgeous bread. 😀 Maybe someday I will also be able to create pretty things out of delicious bread. That’s a mighty fine looking loaf. I have signed up to a bread making day in April and I can’t wait! I think I actually prefer bread making to cake making. This looks much healthier than a foccacia too since it isn’t drizzled with oil. Thanks, Noodle! Oh, enjoy that! It sounds cool :D.
What a beautiful loaf of bread! Rosemary in bread is irresistible to me. Thanks – it is to me too! The bread looks fantastic. I am going to make this tonight. Looks amazing. Definitely will try. Thanks :). I’m glad you think so. oh this is lovely…I do so miss making my own proper bread (wheat intolerant :(( ). This is gorgeous…can’t beat rosemary and sea salt … beautifully presented too. Lovely photos! Thanks! Oh no! what a shame. I’m glad you like it. Beautiful! So simple and pretty. I am going to be trying this soon! Thanks Nick. Thanks, Cecilia. Rosemary is my favourite herb, particularly in bread. This looks beautiful! I love recipes with fresh rosemary – so delicious! Thanks – it is probably my favourite herb. 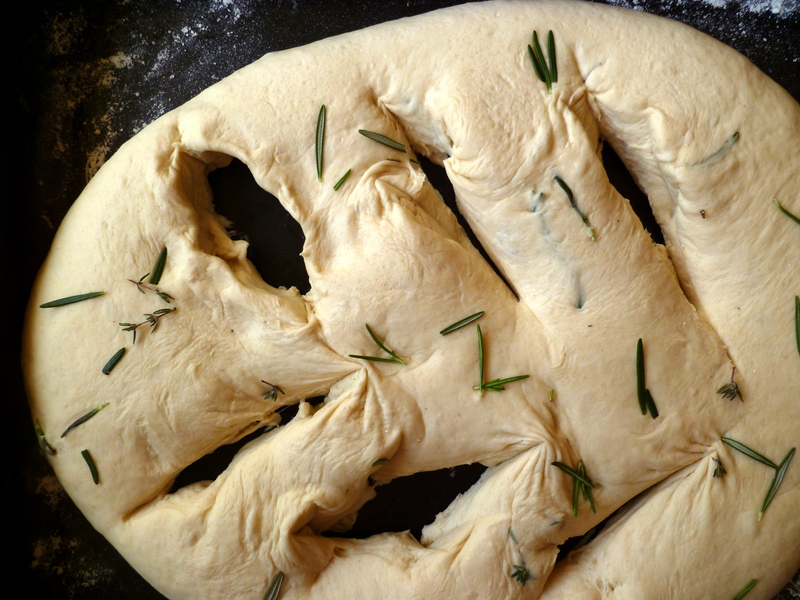 I have always meant to try making fougasse. Those Provençal boulangeries have got nothing on you—looks great! 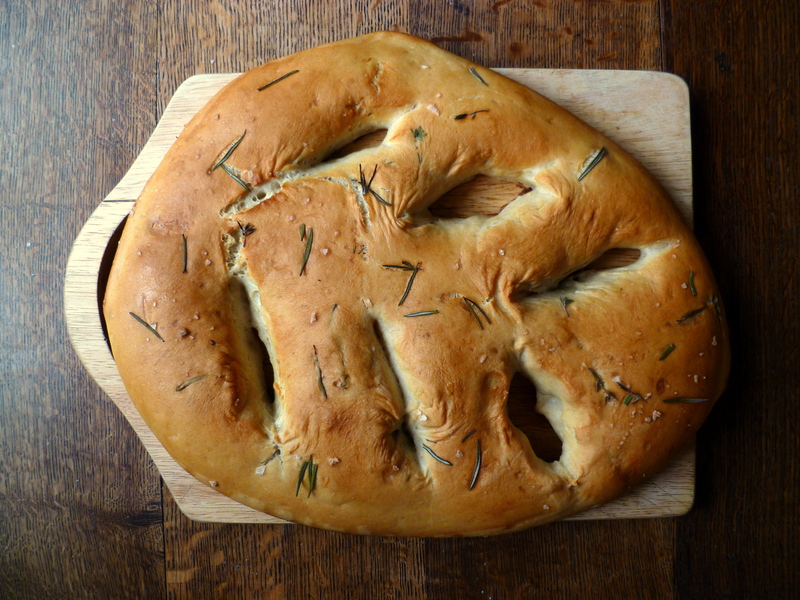 That´s such a beautiful looking bread and I can imagine it tastes amazing with the rosemary…I think I´ll make this next time Bread Man isn´t due to call! Thanks – it does! Who is bread man? This loaf looks absolutely perfect! 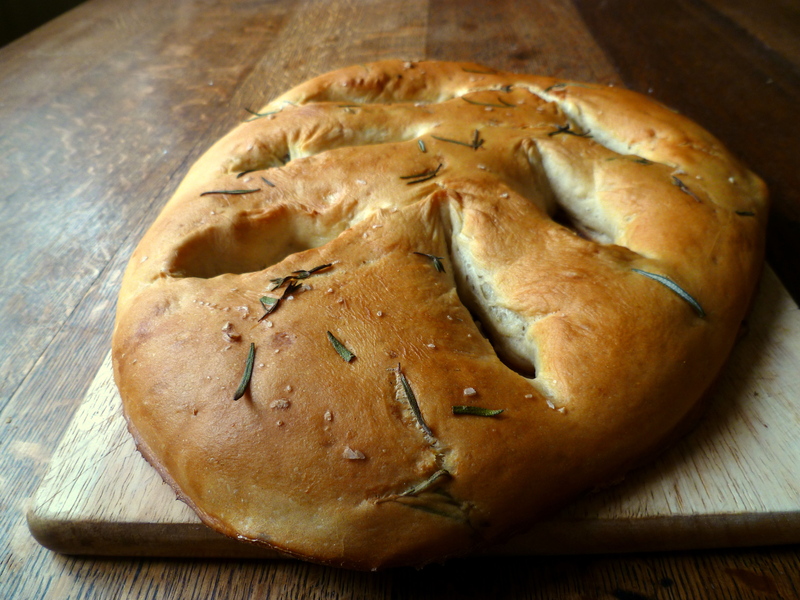 I have never tired making fougasse, I would like to try. This sounds like the perfect place to start! Thanks! You should give it a pop – it was lovely. I’m baking all the time the reason being not so much the cost but the cost for quality. Don’t know over there, but here a loaf of bread on top of costing 10-20 times more than it cost me to bake it, also tastes worse than my attempts…. Yes, exactly. One can buy really nice loaves here – but they cost an arm and a leg. It’s so pretty that it has to be delicious. Thanks for sharing! Yum! I may have to try that tomorrow. Oh that sounds cool – I shall have to try one of those day courses – my girlfriend is doing a pasta making one soon. What a stunning loaf of bread, I will have to bake this some time, thanks for sharing. Oh this one is a must try! That last photo captured the rustic appeal you mentioned — a beautiful thing indeed! Hi, sorry if this is a repeat of a comment, but I’ve nominated you for the Versatile Blogger Award! I was nominated so I’m passing on the blogging love! (It seems all the comments I left yesterday on the nominees are not showing up, so I’m commenting again). Go to my post for the VBA and click on the green badge. Have fun! Bread baking rocks and this looks beautiful! Thanks – I find it extremely therapeutic. Beautiful loaf. Baking bread is something I want to start doing on a regular basis. Thanks! I want to as well, but it’s not always possible. That is a beautiful fougassse, Frugal. And so simple! I have to try this. Thanks for posting the recipe! Thanks! You simply must give it a go! Love the rustic nature and leafy shape of this awesome French bread!! Thanks! It’s probably the thing that most drew me to it. That’s one pretty loaf of bread. Great stuff. Did you eat this bread plain, turn it into a sandwich, or … ? Either way, must have been tasty. and by over, I of course meant oven. Damn. Haha! Might be a little tricky to work that one… I’m glad you think so, Cara. Hah, awesome! I love the kneading, it’s so fun :). I love the onion idea! what a beautiful bread! I love rosemary…. oh this look fantastic! thanks so much for stopping by, your recipes look really tasty!! Same to you! Thanks for the lovely comment. Beautiful loaf – I tend to bake with sourdough, but this may just tempt me to use those sachets of yeast I have been keeping in the pantry for an emergency! Thanks! You must give it a shot :). After making this, my wife and I highly recommend this bread. This looks fantastic. I’m admittedly terrible at break making but it’s a skill that I’ve been wanting to put some time into bettering myself. Woah, sound so easy and delicious. I love rosemary… and salt! Can’t wait to try it. Oh, my goodness, this is so impressive.. I think it is a devastatingly pretty loaf for sure!! You’re very talented that’s for certain! I’d love to try this one, I love the whole design idea and the flavors.. I love rosemary!! Awesome – I saw it :D. Looked great. sounds and looks amazing! love your blog! I will! Thanks for having me! Lovely loaf of bread! looks sooo delicious, will definitely have to try it! Wow! Looks yummy and pretty! Almost too pretty to eat! Almost, but not quite – that’s the important thing. Haha! Thanks. You should make it, it is SO simple. Vegetables Galore w/Roast Chicken « What to Cook?